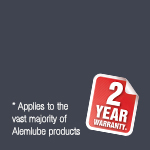 Your Alemlube product is warranted to the original user against defects in workmanship or materials under normal use for a period of twenty four months* after purchase date unless stated otherwise. Any product which is determined to be defective in material and workmanship and returned to Alemlube P/L, shipping costs prepaid, will be repaired or replaced at Alemlube’s option. This warranty also covers parts that are subject to wear such as O rings, packings, seals, springs, electronic and even electrical components. The warranty does not cover damage or failure which in the judgement of Alemlube arises from misuse, abrasion, corrosion, negligence, accidental damage, faulty installation or tampering. If Alemlube inspection discloses no defect in material or workmanship, repair or replacement and return will be made at customary charges. Alemlube has made a diligent effort to accurately illustrate and describe its product in all its literature. However, such illustrations and descriptions are not a warranty. The above express warranty is in lieu of and excludes all other warranties, express or implied, including, without limitation, merchantability or fitness for a particular purpose. The purchaser shall give written notice of any claim to Alemlube within ten days after discovery of any alleged defect. Alemlube shall not be liable for consequential damages, losses, delays, labour costs or any other expense directly or indirectly arising from use of the product, its liability being expressly limited to the replacement or repair of any defective product or an allowance of credit therefore. The remedy and recovery of the purchaser on ant claim against Alemlube, whether based on contract of this warranty or any alleged negligence shall be as stated and limited herein and shall be exclusive.